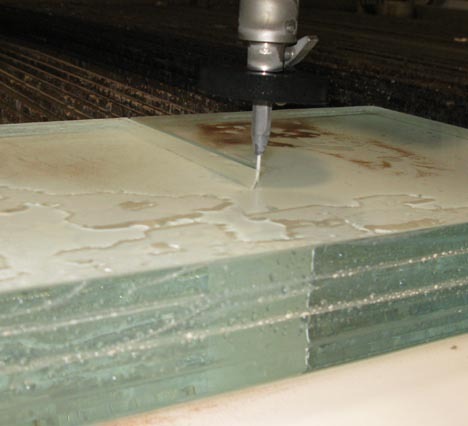 High pressure abrasive waterjets (AWJ) are able to cut glass with considerable precision, and maintain the accuracy of cut through thick material. Because of this precision, and because the glass can be cut to leave very delicate webs between adjacent cuts, AWJ glass-cutting has been used to create art objects for a number of years. It is not as easy as it might at first seem, and Dr. Vanessa Cutler an international leader in advanced cutting, has used the tool to create significant works of art, She has also written on the problems that can arise in cutting what often seems to be a simple, consistent material. (Noting, in passing that through the combination of computer control and memory it is easier at times to re-create works that break than would be the case with other tools for artistic creation). For the more mundane cutting world that comprises the rest of us, cutting glass is more likely restricted to simple activities such as cutting the parts for the windows of wood furnaces. 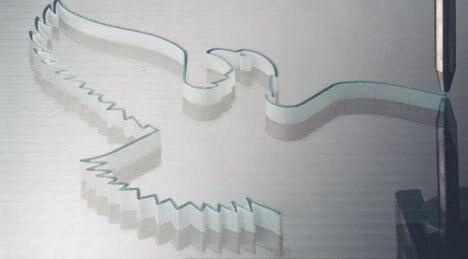 When the cuts are this simple, time can be saved by stacking two or more sheets of glass, one on top of the other, and cutting all of them at the same time. 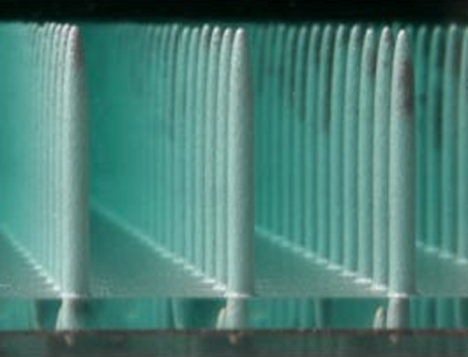 As one learns the parameters, thicker and greater numbers of plates can be stacked, and still successfully cut. However, if one gets too ambitious, and stacks too many plates then the lower plates may start to crack, often after the cut has started into the plate. 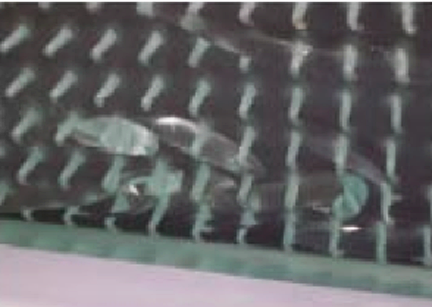 As Dr. Cutler has noted in her new book “New Technologies in Glass”, cracks can also create problems for the unwary in dealing with internal stresses in the structure of the glass. There can be several reasons for this, but it primarily goes back to the point I made in the introduction, about water pressure causing existing cracks and weakness planes to grow, as a way of removing material. There are two sorts of cracks that exist in glass, those created by the impact of the abrasive particles themselves, and those that were already present in the glass. Figure 3. 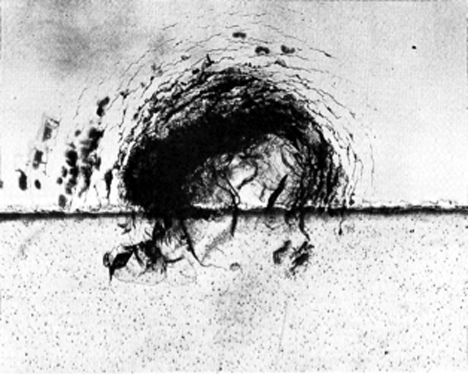 Micro-photograph showing cracks growing out from the point where two abrasive particles struck a piece of glass. (This was adjacent to the main cutting path). Figure 4. 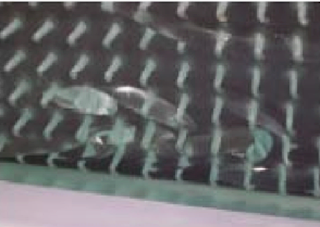 Micro-photograph of the edge of the main cut by an AWJ on glass, showing that it is made up of the intersection of adjacent cracks created by the abrasive impact. I’ll write about the mechanics of cutting glass in a later post or two, but for the moment I would like to write about the basics of crack growth from the point of view of cracks that already exist in the material. In large part this won’t be using waterjets alone to cut glass. Rather there are lots of other materials, particularly soil and rock, which have much higher crack densities, and longer cracks which make it easier to cut and remove material. But first a little demonstration you can carry out. Take a strip of paper, and cut a slit in it half way along the strip and half way through the paper. Now take both ends of the paper in your hands and pull them apart. This causes the cut (the crack) to grow through the paper and gives you two halves. If you do this a second time you should find that by stopping moving your hands you can stop the cut from growing all the way through the paper. Now repeat the process, but use a piece of paper that you have not cut a slot in. The amount of force you need to pull the paper apart is much higher, and I seriously doubt that one you get the tear (crack) to start that you can stop it before it goes all the way through the paper. (Remember this, and I'll come back to it a bit later in time). The idea of putting cracks on the edge of packages to lower the force you need to tear them open can be found on the edge of lots of candy bars, packs of peanuts and other goodies in stores. The serrated edge acts as a series of cuts or cracks, that concentrate the force applied when you pull on the edges of the packet so that the package tears at a much lower force, and you can control the tear so that you don’t end up throwing all the contents around the room. Now at this point you might say that there aren’t any cracks in glass, when we start to cut it. If the glass is very new this is true, but with all the chemicals in the air, and the dust that is carried in the wind, although glass can look clear, the surface actually contains a lot of very fine cracks. 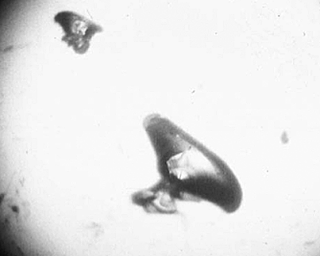 John Field, one of the earlier investigators of high-pressure waterjet impact, showed this in one of those brilliant, yet simple demonstrations that, in this case, he carried out some forty-five-odd years ago. If waterjet impact grows surface cracks, and glass acquires surface cracks from damage through being out in the air, then if that surface layer is removed, then the underlying glass will have no cracks. So John took a glass slide, and etched off the surface of the lower half of the slide, by immersing it in acid. Then he fired a very high-speed droplet of water at the point on the slide where the acid etch stopped. In a single picture he captured the evidence that waterjets work by growing cracks (top half), and that without cracks there is no damage (bottom half). Understanding this opens up a whole vista of different applications, from the removal of soil from around pipelines underground (the new technology of hydro-excavation) to the removal of damaged concrete, while leaving healthy concrete in place (the developed field of hydro-demolition). And these, and other topics will be part of this series, as it moves forward. But as John showed, not all the cracks a jet will grow can be seen, and as Vanessa found, they don’t have to be at the surface to create problems. One of her early pieces was entitled “p1.” Within it are an uncountable series of holes, drilled deep into the glass. Figure 7. Detail of the glass sculpture "p1", by Vanessa Cutler. One of the skills Vanessa has learned is in controlling the quality of the pierce, and its dimension, but initially there had to be a period of learning. Figure 8. 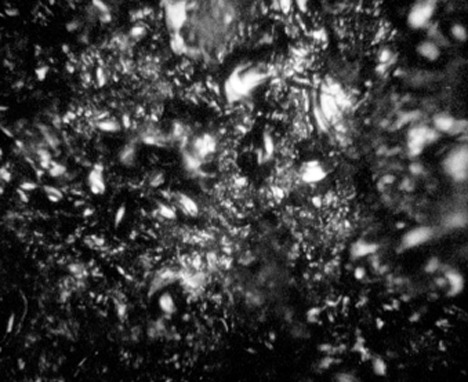 Single cracks growing out from partial piercings in a test piece during development (Vanessa Cutler). And so, in the next sequence of posts the simple idea of growing existing cracks will be explored. Mainly, in the beginning, this will focus on cracks that are already there, and how to usefully make them grow. But in some cases we don’t want all those cracks to grow, and that will also come up, as this series continues. Thanks for the comment, I'll talk more on deeper cuts in later posts. Thanks for sharing this information. Cutting glasses is really not easy. It should be taken with special precaution.